SM Entertainment, home to a number of high-profile K-pop acts including EXO, Girls’ Generation, Super Junior, f(x) and SHINee, has added a new group for the first time in two years. The agency officially debuted its latest girl group Red Velvet with a new teaser clip and an announcement on its website, Monday. Red Velvet consists of four members: Seulgi, Irene and Wendy, all SM trainees previously revealed to the public as part of the predebut team SM Rookies, and new member Joy, who has also trained under the SM system. “The group’s name Red Velvet brings together red, a fiery and seductive color, and velvet, which evokes feminine and soft images. 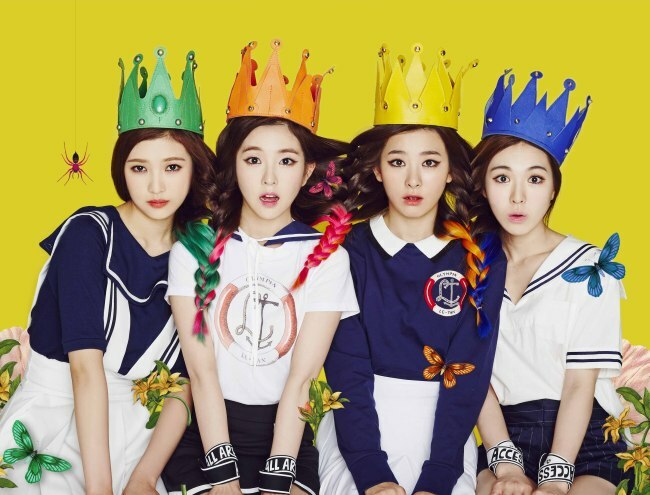 As its name suggests, Red Velvet seeks to impress the world with its unique colors as well as polished music and performances,” said SM Entertainment. Red Velvet will release its debut single “Happiness” online through various music websites on Aug. 4 and begin its formal activities as a group.